Prince Harry arrives at London Mara-thon after Queen starts it off. 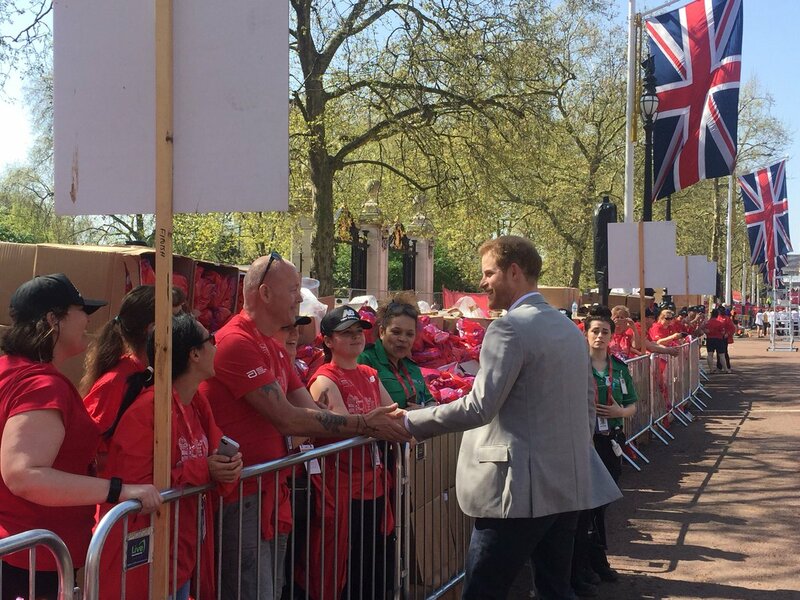 Prince Harry has been spotted at the London Marathon, where he will be cheering on the runners who are still going. The Queen, pressed the starting button, sending a tide of more than 40,000 runners through the capital. She looked bright and cheerful in a coral pink outfit, and as usual matched her hat to her jacket. The Prince met the volunteers who make the marathon happen, organising the runners and handing out water. He also shook hands with First Aiders from St John’s Ambulance, who are there in case participants face any medical issues. Prince Harry will be handing out trophies to all the winners, and has already congratulated the wheelchair winners. Familiar faces were seen at the starting line, including the Telegraph’s Bryony Gordon, who is running in her underwear alongside Jada Sezer in order to raise money for mental health charity Heads Together. BBC Radio 2 DJ and former Top Gear host Chris Evans grinned as he posed for a picture before the marathon, as did television presenter Jenni Falconer. Olympic gold medalist Mo Farah has been seen leading the pack, as he hopes to win this year. He has been training for the race in Ethiopa for the last few months. The 38th edition of the world-famous race may well be the hottest on record, with sweltering highs of 23C possible throughout Sunday. Runners have been advised to drop their goal-times and organisers have added more ice, water and run-through shower stations along the 26.2-mile course. Among this year’s runners are firefighters who tackled the Grenfell Tower blaze, a police officer stabbed in the London Bridge terror attack and members of the Stephen Lawrence Charitable Trust. Sunday marks 25 years since the murder of the teenager, who was a keen runner. Meanwhile almost 100 runners will attempt Guinness World Records – dressed variously in suits of armour, as mythical creatures, and wearing stilts and ski boots. Hundreds of police officers will be on duty to keep around 800,000 spectators and runners safe. Competitors will start from Blackheath, south east London, running a snaking route along both sides of the Thames, finishing on The Mall near Buckingham Palace. Last year, the event raised £61.5 million for charity, a world record for an annual one-day fundraising event, making the total raised since 1981 around £890 million, organisers said. A record 386,050 people applied for this year’s race – almost a third more than last year and the highest number for any marathon in the world. This entry was posted in Documentation and tagged HM Elizabeth II - Queen of the United Kingdom, HRH Harry - Duke of Sussex, London, Marathon. Bookmark the permalink.